Who Are The Syrian Rebels? : Parallels Researchers argue that through social media and on-the-ground research, a detailed portrait of the Syrian rebels has emerged. This goes against the conventional wisdom, which holds that little is known about the rebel factions. A rebel fighter inspects purchases made by civilians as they cross through a building near the front lines in Aleppo, in northern Syria, on Monday. The city has been divided for more than a year, with the rebels holding the eastern part and government troops holding the west. When it comes to Syria's rebels, the conventional wisdom in Washington has been that there are countless factions with a range of agendas and it's difficult, if not impossible, to know exactly who they are. But ask researchers who've spent two years digging into social media and YouTube videos and they offer a remarkably detailed picture of rebel brigades, their ideologies and their arsenal of weapons in the fight against President Bashar Assad's regime. "It's a myth that we don't know about the rebels," says David Kilcullen, the CEO of Caerus, a Virginia-based strategy firm that tracks Syria's governance councils for clients that include the U.S. government, aid agencies and development banks. Kilcullen, a former counterterrorism strategist at the U.S. State Department, says the Syrian conflict is the most open in history. One rebel group, the Free Syrian Army, supports seven YouTube channels, updated daily. Islamist battalions wage "hearts and minds" campaigns on Facebook. 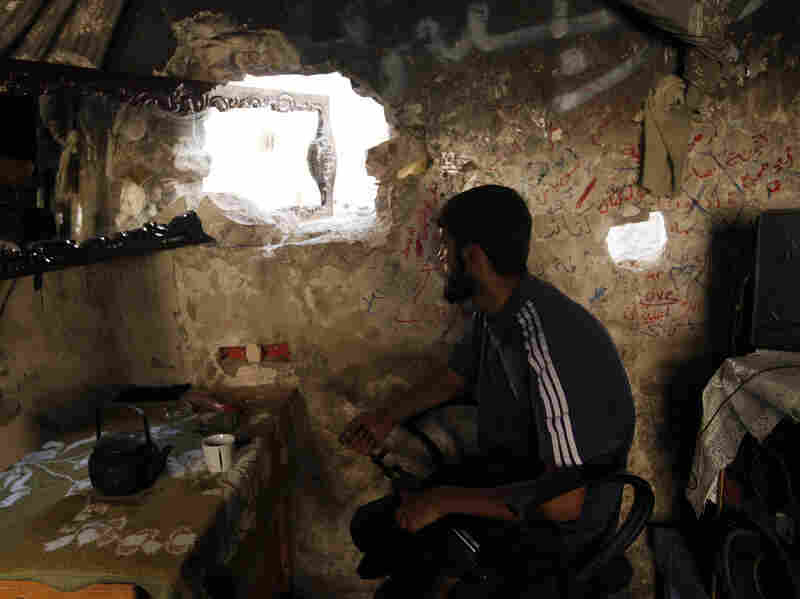 Syria activists and fighters maintain hundreds of Twitter feeds. "There is a new level of connectivity," Kilcullen says. "We have an enormous data base. It's easy to know what's going on. It's hard to validate." For Kilcullen, one of the key takeaways is that the more moderate rebel groups are becoming less influential in comparison to the more radical Islamist factions. "The civilian, secular democracy folks have been sidelined," says Kilcullen. "That is just a fact of life and I do think it's tragic. Today, you are looking at a polarized resistance, a larger number at the extremes." Researchers at Caerus spend hours calling into Syria to confirm videos for detailed analyses that include monthly reports on the price of bread in the bakeries of northern Syria, where much of the fighting takes place. Nathaniel Rosenblatt, a Caerus researcher, is working on a study of rebel checkpoints around Aleppo, Syria's largest city in the north of the country. A rebel fighter keeps watch for government troops in Aleppo on Sunday. "Who has them and who controls them. It's an important political aspect" to understand the political dynamics of Aleppo, says Rosenblatt. He is training a team of Syrians to conduct research there for the project. The U.S. Special Operations Command commissioned a study of rebel groups last year, working with pollsters and drawing on a network of activists. Mouaz Moustafa, who works for the Syrian Emergency Task Force, an advocacy group based in Washington, carried out the polling. He says his organization interviewed 1,000 people in 14 Syrian provinces. Moustafa says he's had multiple meetings with Gen. Martin Dempsey, the chairman of the Joint Chiefs of Staff, as well as other key military officials. "I can say in confidence that the U.S. government knows who the rebels are," he says. "They know who the good guys are, who the bad guys are." Research into the Syria war has become more sophisticated as the war has dragged on over the past two years. Joe Holliday, a research fellow at the Institute for the Study of War, published "Who Are The Syrian Rebels" in March 2012 based on videos from the battlefield. Holliday's comprehensive study includes names of commanders, photographs and battalion affiliations. His study appeared the same month that the then-defense secretary, Leon Panetta, told the Senate Armed Services Committee that the U.S. had little knowledge of the rebels. "There has been no single unifying military alternative that can be recognized, appointed or contacted," Panetta said. Battlefield videos have been a boon for researchers documenting rebel munitions. 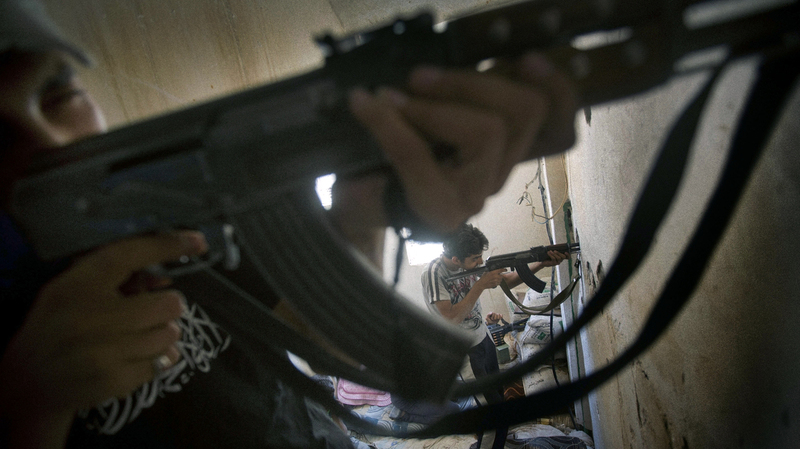 Rebel fighters aim at government troops during fighting in the eastern town of Deir Ezzor on Saturday. Eliot Higgins, a blogger who lives in a London suburb, has watched the Syrian war from his laptop. 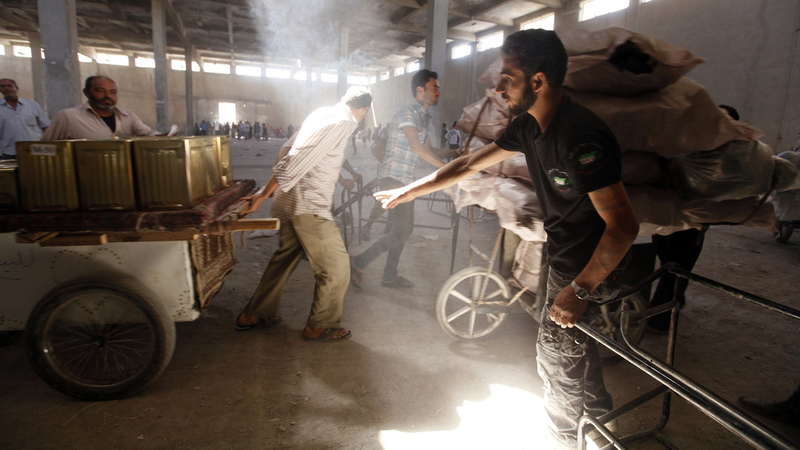 He obsessively dissects videos to examine the weapons of the rebels and the Syrian regime. His Brown Moses Blog is widely cited by journalists and human rights groups and followed by government officials. Higgins was the first to spot the Syrian regime using cluster bombs and documented the rebels' first use of shoulder-fired heat-seeking missiles. "I've got a very good idea of what they have," Higgins says of the rebel arsenal, "and a general idea of how much they have, and when they first had it." Higgins is also clear on what researchers don't know, such as how many rebel groups are in Syria. He says there is a problem with the estimates because they don't take into consideration that some of the opposition groups are local militias that defend only their own towns. These groups don't fight as part of a larger force. "Saying someone has 10,000 troops isn't much use if 9,000 of them won't leave their home towns," he notes. Aron Lund, a Swedish journalist who specialized in charting the Islamist militants in the rebel ranks, agrees that any estimate of the number of rebels is difficult. "There's a lot of movement between these groups, alliances across ideological boundaries," he says. There are joint operations reported in most battles, he says, and rebels are often motivated by tribal and family ties rather than ideology. How many rebels are moderates and how many are extremists? This is the hardest question to answer with any certainty, say all of these analysts. In the U.S. debate, "moderate' tends to get translated as "secular," says Lund. The rebellion is now heavily colored by religion, he adds. "Most of the groups are not secular" in any way recognizable to Americans, he says. "That doesn't necessarily mean you can't work with rebels just because some are very conservative or even radical Islamists. The U.S. has worked with sectarian and Islamist groups before in Iraq and Libya." These researchers have documented the radicalization of the rebel movement over time and some of the radicalization is driven by outside funders, mostly in the Gulf. "The data is there," says Elizabeth Mohan with Caerus. "You could have predicted a year ago it was going to get more Islamist." These groups have become very adept at changing their rhetoric to what the funders want to hear, says Mohan. Groups are becoming more Islamic because they know what their funders want to hear and the rebels want weapons. As the U.S. considers giving more aid to the rebels, but agonizes over supporting groups that have links to more radical Islamist brigades, Kilcullen says this is a self-inflicted quagmire. "We made it harder than it needed to be by waiting," he says of the U.S. hesitation to arm the rebels. "Part of it is the way the funding works, decentralized on the resistance side pulls it apart, because we've waited too long."